Coyotes Hire ‘Difference Maker’ to be G.M. 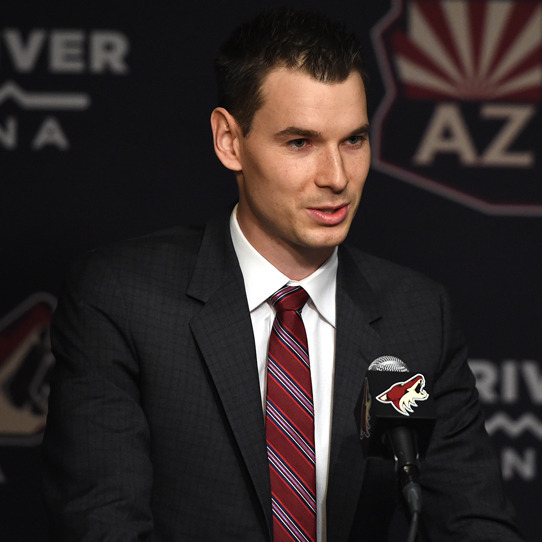 GLENDALE – The Coyotes announced the hiring of 26-year-old John Chayka as the eighth general manager in franchise history on Thursday at Gila River Arena. 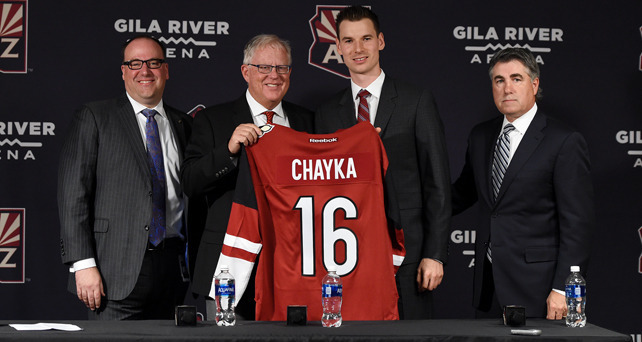 It was an historic moment as Chayka has become the youngest general manager in professional sports history. The Coyotes considered 10-12 candidates for the position and Chayka, who recently completed his first season with the team as an assistant general manager focused on analytics, was a leading candidate from the start. Anthony LeBlanc, Gary Drummond, John Chayka & Dave Tippett. Photo by Norm Hall. Before joining the team, Chayka co-founded and served as director of hockey operations at Stathletes Inc., a hockey analytics firm that provides insight into player and team tendencies. The Coyotes also announced that Gary Drummond has taken over as President of Hockey Operations, and that Dave Tippett has agreed to a new five-year contract to be Executive Vice President of Hockey Operations/Head Coach. “John is the youngest GM in the history of pro sports and I think I'm probably the oldest guy ever to get his first hockey job," said Drummond, 65, who has been a co-owner of the team for the past three seasons. Tippett said he believes Chayka is a terrific choice for the G.M. position. The Coyotes plan to add an assistant general manager with NHL management experience before the NHL Draft on June 24. John Chayka. Photo by Norm Hall. “Experience is one of my weaknesses and I’m aware of that,” Chayka said. “That’s why we’re putting in place a group that addresses that... It’s not about collecting good players. It’s about collecting players that fit our system, that fit our blueprint. Dave Tippett’s going to be a big part of that blueprint. We’re in the process of defining that criteria and narrowing our scope." Chayka said his first order of business as G.M. would be to have lunch with captain Shane Doan, who is mulling his future. Seven players from the season-finale roster, including Doan, are set to become unrestricted free agents this summer. Nine players will become restricted free agents. That’s a lot of decisions to make for the restructured hockey operations department.